The unofficial end of summer is upon us, and the climate is leaving its mark. 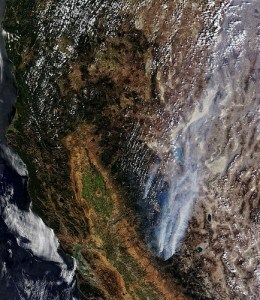 MODIS image of northern California and Nevada showing the Rim and American Fires, both sending plumes of smoke over to the Burning Man Festival, currently being held in the Black Rock Desert. As of last week, 51 wildfires were still burning across the country, prompting the federal government to raise the national firefighters preparedness level to its highest rating effectively putting firefighters on a “war footing” reports Climate Central. The most significant wildfire still raging is in Yosemite National Park, and its threatening San Francisco’s water supply. Texas is now in its third year of drought. Last week’s report from the Texas government shows 97% of the state is suffering from drought.. Texas is not alone, 63% of the nation was experiencing drought conditions at the end of July. None of that should surprise since July was the hottest month ever in America since record keeping began in 1895, extending a 28-year streak of above average temperatures. If you want to try to find the silver lining, you might note that we haven’t had any hurricanes yet this year. But so far, that’s just a bit of luck. The increased water vapor from climate change doesn’t create hurricanes, it just makes hurricanes that form stronger. And the hurricane season isn’t over yet.